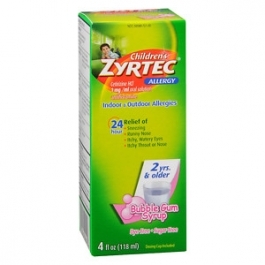 Temporarily relieves symptoms associated hay fever or other upper respiratory allergies: itching of the nose and throat, itchy, watery eyes, runny nose and sneezing. Directions: Use Only With Enclosed Dosing Cup: Adults and Children 6 Years and Over: 1 Teaspoonful (5 Ml) Or 2 Teaspoonfuls (10 Ml) Once Daily Depending Upon Severity of Symptoms; Do Not Take More Than 2 Teaspoonfuls (10 Ml) In 24 Hours. Adults 65 Years and Over: 1 Teaspoon (5 Ml) Once Daily; Do Not Take More Than 1 Teaspoonful (5 Ml) In 24 Hours; Children 2 to Under 6 Years of Age: 1/2 Teaspoonful (2.5 Ml) Once Daily. If Needed, Dose Can Be Increased to A Maximum of 1 Teaspoonful (5 Ml) Once Daily Or 1/2 Teaspoonful (2.5 Ml) Every 12 Hours. Do Not Give More Than 1 Teaspoonful (5 Ml) In 24 Hours; Children Under 2 Years of Age: Ask A Doctor; Consumers With Liver Or Kidney Disease: Ask A Doctor. Active Ingredient (In Each 5 Ml Teaspoonfool): Cetirizine Hci 5 Mg (Antihistamine). Inactive Ingredients: Anhydrous Citric Acid, Flavors, Propylene Glycol, Purified Water, Sodium Benzoate, Sorbitol Solution, Sucralose.